This node will retrieve a Survey Point location from the model. 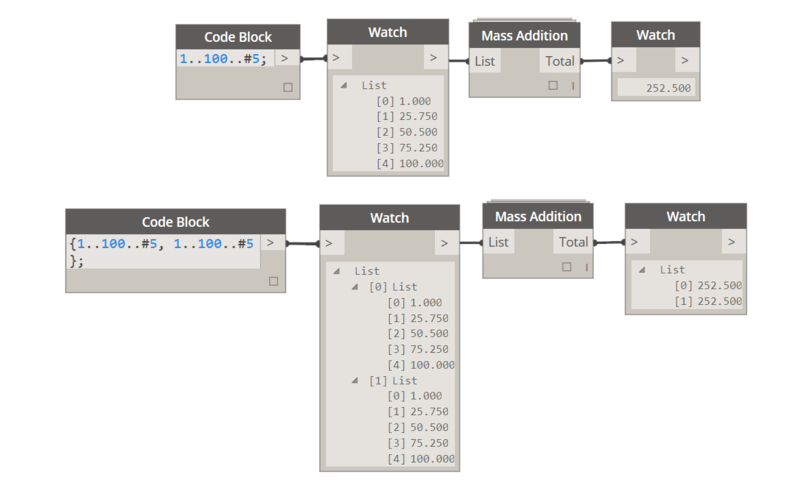 This node will perform a mass addition operation on a list of numbers. This means that it will sum all components of a list and return a single value. In case that a list of lists is supplied the result will be a list that contains sum values for each sub-list. This node will return a level above the level that was supplied. In case that level supplied is the highest level in the project, a NULL will be returned. This node returns floor area of a given floor. This node takes an input of a Point and tries to retrieve a room that given point is inside. Please note that this node has only been tested on local models, but it is possible to test linked models with a small modification. This node will take an input of a room and retrieve its bounding elements. In most cases it will be Walls or Room Separation Lines. It will also return a list of Curves (Lines and Arcs), that bound the Room. Please note that in some cases, if room is not completely enclosed, additional curves are added automatically by Revit to ensure that Room is properly bound. In those cases the returned curve will not have an associated bounding element, and instead will return Null. This node takes an input of a Wall and returns a Vector that is perpendicular to that Wall (Line based Walls) or a Vector that is perpendicular to Wall’s tangent curve at its mid point (Arc based Walls). This node will take an input of an Element and a Type while returning a Boolean (True/False), checking if given Element is of the given Type. This node will retrieve the Material Asset Element stored inside of each supplied Material. If a Material doesn’t have Asset specified (it’s possible) then null will be returned. This node will import ALL of the Materials from specified Revit Project into current Revit Project. By default it will not override materials with the same name that are already existing in the current project. This node will override ALL of the specified Material’s Assets (Target Material input) to a single specified asset from Source Material. Material assets are most commonly known as Rendering Properties of a Material or its Structural Properties. They can be found in a Material Editor. This node was developed to override all of the materials to a single rendering asset for purpose of creating diagram (clay) renderings out of Revit. This node will override ALL of the specified Material’s Assets (Target Material input) to Assets define in Asset Id input. These two lists must be of matching order (one Asset Id for one Target Material) for this node to work properly. Please see above for explanation of what is Material Asset.